Jennifer S. Alderson's Blog - Posts Tagged "netherlands"
Hello everyone! I’m about to head off on a travel adventure / family reunion, and just wanted to THANK all of the new readers who’ve found my second novel, The Lover's Portrait: An Art Mystery. Even in its third week of release, it’s still topping the Art Mystery lists on Amazon UK, USA, Germany, and the Netherlands (bedankt! ), as well as Kobo and Barnes & Noble! I'm also thrilled to see two fantastic reviews on Goodreads, one on Amazon.com and one on iBooks already -- amazing! I’m grateful to all of you for taking a chance on a new author, and letting everyone know what you think of it!! I’m also happy to announce that my book is being supported by Pink Point Amsterdam, the world’s first gay & lesbian (LGBTI) tourist kiosk, located in the heart of Amsterdam next to the Westerkerk. To find out more information, see the pinned link on my Facebook page: http://www.facebook.com/JenniferSAlde... .
Additionally, two lovely stores in Amsterdam are already stocking my second novel, Boekhandel Vrolijk (Gay and Lesbian book store) and Caffe il Momento (Specialty coffee and gifts). More about them (and direct links) on my website: http://www.jennifersalderson.com/. Fantastic new review by Publishers Weekly reviewer! When your book is entered into a contest, especially one which includes a Critic's Report written by a professional reviewer, you can't help but get nervous, hoping and praying the reviewer finds *something* enjoyable about your book. So it was an enormous relief to see this very fine review, as part of the BookLife Prize for Fiction contest, written by a Publishers Weekly reviewer! The competition is fierce as there are quite a few great books participating. I will know mid-October if The Lover's Portrait: An Art Mystery makes it to the next round, but either way this review makes me feel like a winner! Happy New Year​ from Amsterdam! I hope 2017 is good to you! 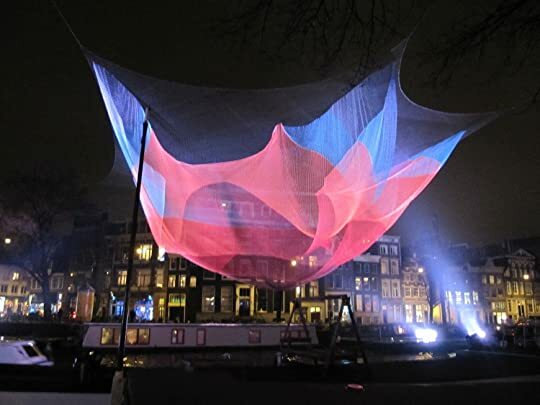 My latest blog post is actually about an amazing festival of light art installations called the Amsterdam Light Festival. I am truly indebted to those who have bought my books, reviewed them or told their friends about them. Without your support and encouragement, I wouldn’t be able to call my first year as published author a success. Thank you! 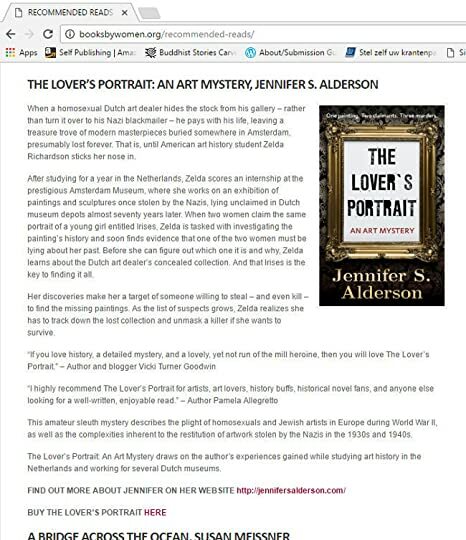 I'm thrilled to see an article I wrote about archival research and The Lover's Portrait: An Art Mystery now featured on Women Writers, Women's Books! Many thanks, Barbara Bos​ and the WWWB team. I am thrilled to see The Lover's Portrait: An Art Mystery is one of Women Writers, Women’s Books Recommended Reads for April 2017! HAPPY PUBLICATION DAY, Rituals of the Dead: An Artifact Mystery! My historical mystery set in Papua and the Netherlands is now available as paperback and eBook on iBooks, Barnes & Noble, and Amazon! "This exciting story is also an education about a culture of which I knew very little. The actions of colonial powers, the church and collectors of artifacts is called into questions but there is also our moral dilemma of whether to exhibit treasures from the past or return them to their source. But don’t let this put you off; you will be on the edge of your seat wondering if Zelda will take one risk too many as well as wishing to discover what actually happened to Nicholas Mayfield. A thoroughly good read." '“Rituals of the Dead” just blew me away. The pace is fast without being hectic; the intrigue unfolds steadily, sustaining the reader’s interest to the very end. I enjoyed every single line of the book, but my favourite parts were the flashbacks where the author offers a glimpse of a culture that I know very little about. The chapters set in Papua and New Guinea, the insights into the life and rituals of the Asmat people are, in my opinion, priceless. "5 stars - Simply magnificent, filled with intrigue and suspense, and a lot of wonder!" "History comes alive in this story as Zelda photographs the diary, unearthing a story of murder, greed, missionaries and artifacts. It is not a book one puts down easily. The characters are carefully crafted, engaging you from page one. Alderson takes you from past to present and back again seamlessly as you follow events Zelda has yet to unravel." "Rituals of the Dead is an entertaining and fast paced thriller and I did read the entire novel in one sitting. What made the book even more interesting was the flashbacks to Papua and New Guinea in the sixties. The book is not "only" a thriller, it's also about cultural exploration (and exploitation)." Art history student Zelda Richardson is thrilled to be working at the Tropenmuseum in Amsterdam on an exhibition of bis poles from the Asmat region of New Guinea – the same area where a famous American anthropologist disappeared in 1962. When his journals are found inside one of the bis poles, Zelda is tasked with finding out more about the man’s last days and his connection to these ritual objects. Zelda is pulled into a world of shady anthropologists, headhunters, missionaries, art collectors, and smugglers – where the only certainty is that sins of the past are never fully erased. Join Zelda as she grapples with the anthropologist’s mysterious disappearance fifty years earlier, and a present-day murderer who will do anything to prevent her from discovering the truth. Rituals of the Dead: An Artifact Mystery won a Chill with a Book Readers’ Award! Happy days! Rituals of the Dead: An Artifact Mystery won a Chill with a Book Readers’ Award! Were the characters strong and engaging? Was the book well written? Did the story / plot have you turning the page to find out what happened next? Would you recommend to someone who reads this kind of story? Many thanks to the Chill with a Book reviewers for choosing my latest thriller! Check out the award page here. Stolen artifacts, a missing anthropologist, and a pesky amateur sleuth. Art history student Zelda Richardson is working at the Tropenmuseum in Amsterdam on an exhibition of bis poles from the Asmat region of Papua – the same area where a famous American anthropologist disappeared in 1962. When his journal is found inside one of the bis poles, Zelda is tasked with finding out more about the man’s last days and his connection to these ritual objects. Since finishing Rituals of the Dead: An Artifact Mystery, I have noticed an influx in news reports about the restitution of ethnic artifacts – a topic central to my latest mystery. So we are clear, I am not referring to antiquities such as the Parthenon Marbles (or Elgin Marbles, depending on your nationality). I’m talking about shrunken heads, painted shields, feathered headdresses, carved ancestor sculptures, ritual masks, and the like. The same objects currently filling western museums dedicated to anthropology and ethnography. At first, I thought it was a side effect of my research; I was simply noticing these kinds of articles more often. After all, I’d just spent months pouring over accounts of anthropologists, missionaries, and colonial administers who brought Asmat artwork – specifically bis poles – back home from Papua New Guinea and donated or sold them to Dutch ethnographic museums. He later reiterated his statement by tweeting, “African heritage cannot be the prisoner of French museums”. Many believe this pledge was in response to Benin’s request for the return of thousands of “colonial treasures” taken at the turn of the century. A French court of law denied Benin’s claim. Macron’s remarks shines a spotlight on the origins of western ethnographic museum collections and have re-invigorated calls for restitution. 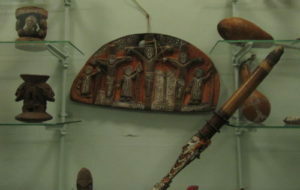 Almost all of these cases concern objects collected for western museums from colonized nations in Africa, South America and Oceania between 1900 and 1970. These artifacts were acquired as representations of the indigenous group’s “otherness”. 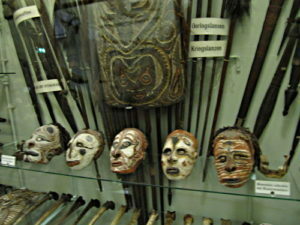 Anything and everything was shipped back home – ancestor statues (such as bis poles), shrunken heads, decorated skulls, kitchen utensils, weapons, shields, musical instruments, sleeping mats, bowls, and even door frames. The weirder, the better. These objects were desired by both museums and private collectors. Public displays emphasized the primitive nature of the indigenous groups’ artistic expression or spiritual beliefs. These exhibitions were also a way of asserting western superiority over these regions and peoples, used to justify their colonization and the (often forced) conversion to Christianity of those living within these colonies. In pretty much every case of colonization, the church was there from the beginning, busy converting locals in the belief they were saving their souls, while helping them adjust to western culture, customs, and technological advancements. Papua New Guinea was no exception. My summary probably seems harsh to you because society has progressed and our attitudes have thankfully changed. Decolonization in the 1960s and 1970s resulted in a new call for equal rights by indigenous peoples – within their own lands and abroad. It also meant that some of these ‘exotic’ peoples were now immigrating to the colonial motherland. In the Netherlands, their presence dictated a change in the ways these people were represented in the country’s ethnographic museums. Many of these museums’ showpieces were removed from public displays and hidden away in their depots. New exhibitions were created which focused on geographical and statistical information, as a way of introducing these post-colonial nations to western viewers. They were often neutral displays, heavily dependent on photographs to illustrate aspects of daily life, such as the ways homes were constructed, fields were sown and the types of clothes locals wore. Only in the last decade or so have these older artifacts been brought back out of storage. However, they are no longer displayed as examples of a people’s “exotic otherness”, but as sublime examples of their cultural and artistic traditions. One of the side effects of the conversion to Christianity was the disappearance of these indigenous groups’ artistic traditions. Sometimes they were voluntarily given up by peoples no longer interested in keeping the “old ways” alive. In other cases, such as Papua New Guinea, their traditions and rituals were banned by Christian missionaries and colonial governments, as part of the pacification process. Nowadays, the objects collected in the 1900s and displayed in western museums are often the finest examples of an artistic tradition that has died out in its country of origin. Pride of culture has led many recently-formed nations and indigenous groups to try and revive these traditions, as a way of reasserting their cultural identity. Their desire to see these historically-significant artifacts returned has also grown stronger. An increasing number of countries in Africa, South America and Oceania are submitting claims on these precious examples of their ancestors’ craftsmanship and artistry. So far, the response has been mixed. More often than not, their claims have been denied. In light of Macron’s promise, how Western museums respond to these new restitution claims will be telling. How deeply-seated are feelings of colonial pride in the present generation? And are western museums willing to give up the best pieces in their ethnographic collections – and risk becoming obsolete – to help these former colonies establish their own cultural institutions? Author’s note: This is a brief introduction to an extraordinarily complex topic. It is based on research I conducted while working as a collection researcher for the Tropenmuseum, writing my master’s thesis, and my novel Rituals of the Dead. References to French President Macron’s promise to return African art mentioned in this article can be found on these news sites: La Monde Afrique, Hyperallergic, New York Times, and the ArtNet News. Rituals of the Dead: An Artifact Mystery is available as paperback, audiobook (June 2018), and eBook via Amazon, iBooks, Kobo, Barnes and Noble NOOK, Google Play, Smashwords, or your favorite retailer. Here’s your chance to win a Dutch goodie bag + a great book! Take time out for yourself this holiday season and de-stress with this lovely Dutch-themed giveaway. You can enter my latest giveaway over on TripFiction’s blog. The goodies bag features Rituals of the Dead, the latest in an exciting series of mystery thrillers set around the globe. This novel is a dual-timeline thriller set in the Netherlands and Papua New Guinea. 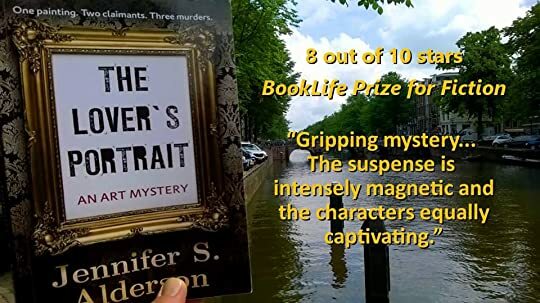 In this novel, amateur sleuth and art history student Zelda Richardson is working at an anthropology museum in Amsterdam. When a missing explorer’s journal is found inside an artifact’s crate, she gets pulled into a world of shady anthropologists, missionaries, headhunters and smugglers – where the only certainty is that sins of the past are never fully erased. Join Zelda as she grapples with the explorer’s mysterious disappearance fifty years earlier, and a present-day murderer who will do everything to prevent her from uncovering the truth. Rituals of the Dead is Book 3 in the Adventures of Zelda Richardson mystery series, but can also be read as a standalone. 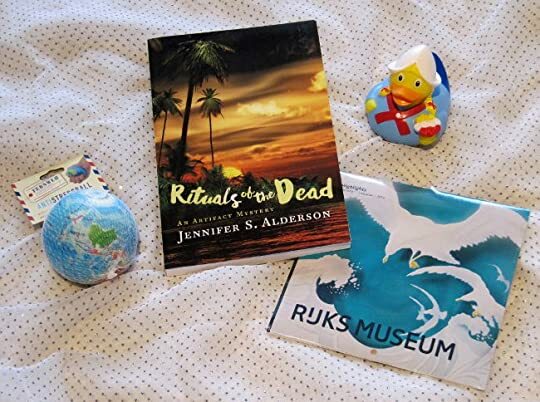 The giveaway also includes several fun gifts to help you unwind: a signed copy of my artifact mystery, a ‘Dutch Girl’ bath duck from the official Amsterdam Duck store, a Rijksmuseum 2019 calender and an anti-stress globe. Leave your comment on TripFiction's blog by midnight, Saturday 1st December (UK time) and TripFiction will choose the winner. This contest is open internationally. Be sure to check out their incredible database of books strong in setting – searchable by country – while you are there. 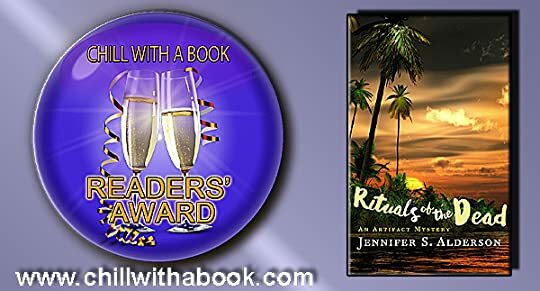 Rituals of the Dead: An Artifact Mystery awarded a B.R.A.G. Medallion! 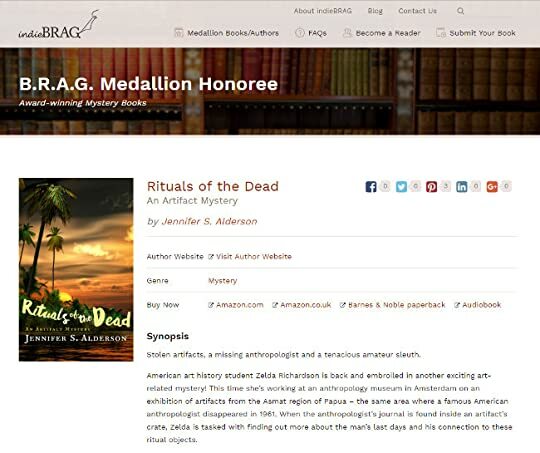 I am extremely grateful to IndieBRAG readers for choosing to award my artifact mystery with this lovely medallion. This book was a passion project; it really makes me happy to see readers connecting with the characters and story! You can find it on IndieBRAG’s site here. Musing and relvant information about my books and the publishing process.